As the summer breeze drifts away and another day marks off the calendar, the process of getting the kids ready to go back to school draws closer. While parents are frantically getting organized for this day, so are the teachers of the world. For some teachers, this can be a time of total hectic chaos and reflection that the summer holidays weren’t nearly long enough. For other teachers, it means an exciting chance to get organized again and set up the classroom ready to welcome the kids. However, you approach the back to school process, there are many products available to help you, as a teacher, get organized and prepared. These products can make it more fun and more interesting getting ready to go back the educational learning institution. For storage purposes in the classroom, whether you need a better space for all the colorful markers for coloring in or more shelving space for books to read to the students, a great product available is the Jonti-Craft Open Storage with Beveled Front. This product has six storage sections of varying shape and size. 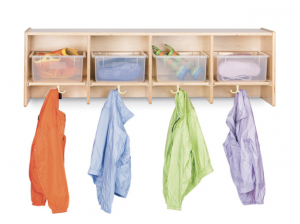 It also has beveled fronts making it easier to store more things without the risk of them falling out when all the little students are reaching for varying objects. It is a great addition to any classroom, whether for early learning spaces or older primary students. There is plenty of potential what you can store in this shelving unit. It suits any aesthetic with its simple wooden design. The fact it isn’t plastic means that it is an investment for the environment and also a longer term investment. It has a sturdy design which means it can be a key feature of your classroom for many years to come. Now, if you’re looking to make the most of your wall space and bring organization to a new level in the classroom, you quite literally can with the Jonti 4 Section Wall Mount Coat Locker. This product is all about a big organization solution for small space. It features 4 double hooks and large storage sections for up to 4 tubs, or anything else you want to put in them. Now, if you’re looking to make the most of your wall space and bring organization to a new level in the classroom, you quite literally can with the Jonti 4 Section Wall Mount Coat Locker. This product is all about a big organization solution for small space. It features 4 double hooks and large storage sections for up to 4 tubs, or anything else you want to put in them. This is a great solution to organize things on the wall. You can use it to store books, papers, and stationery behind your teacher desk, out of reach of the students. The hanging hooks can be used for anything from bags to coats or even sacks of additional materials. Alternatively, it can be used around the classroom within reach of the students. Consider having space for students to hang their bags and coats. The storage space can be used to put books in, making it a mini-library. There are plenty of options for this handy storage unit. This product is also made from wood which means that it is eco-friendly and sturdy. The hooks are highly durable and can support a lot of weight, depending what you use them for. There is space in the shelving section for plastic tubs if you so desire. Take a look around your classroom and see how these products could be used enhance the organization and practicality of the space. With sturdy products for a reasonable price made of strong and reliable wood, you truly are getting a quality long term investment with these. There are many other products available with similar design and function that can spruce up your classroom and get you as excited as your students are for the first day back to school.